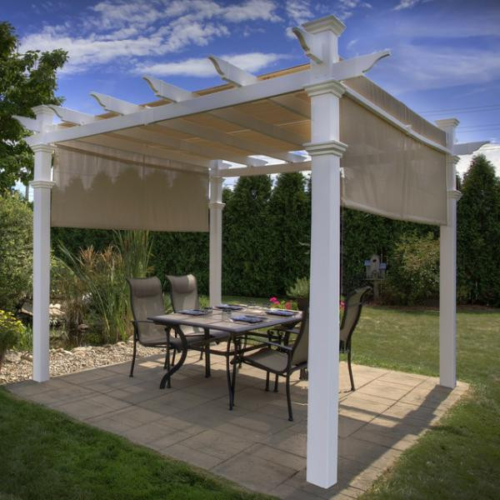 Backyard Shade Structures in Do it yourself kits! 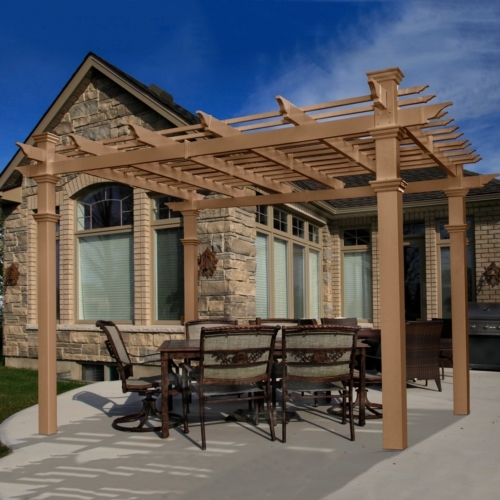 Maintenance free and beautiful backyard pergola shade system with our guarantee that they will not to yellow or fade. 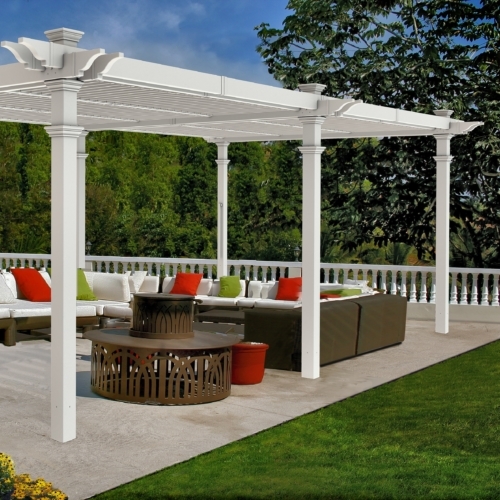 Constructed of high grade PVC vinyl, these prefab pergola's are the perfect addition to your deck or back yard oasis. 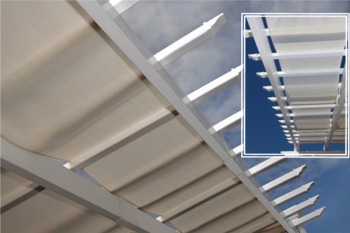 The vinyl material formula contains UV stabilizers to protect the vinyl from harmful ultraviolet rays, so the pergolas will not fade over time...guarenteed. 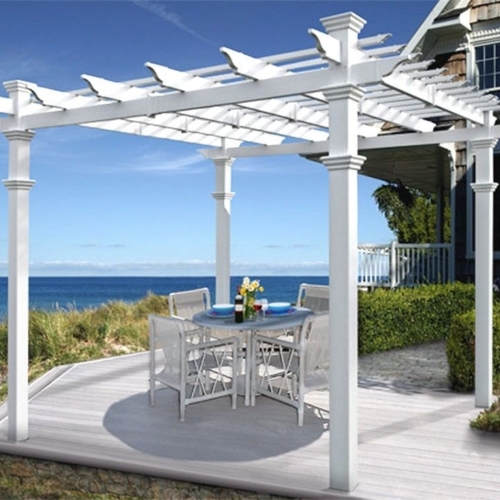 Aesthetically, vinyl pergolas and arbors are second to none in creating a romantic backdrop or design centerpiece in any backyard. 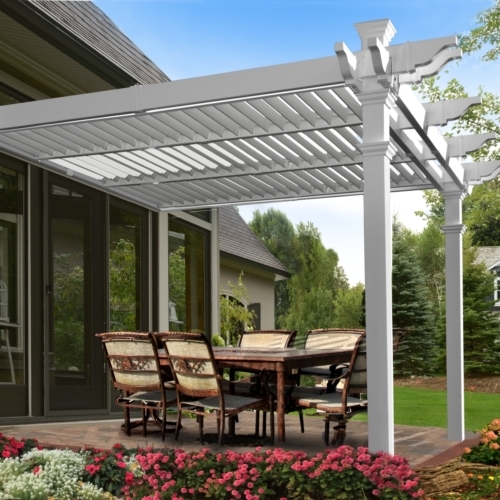 These high quality vinyl pergolas, arbors and trellis applications provide total freedom from maintenance. They never need painting, staining, or sealing to keep their exceptional good looks. They won't fade or yellow and have been field proven to maintain their color. And they will not crack, split, warp or peel like wood or corrode like metal arbors. 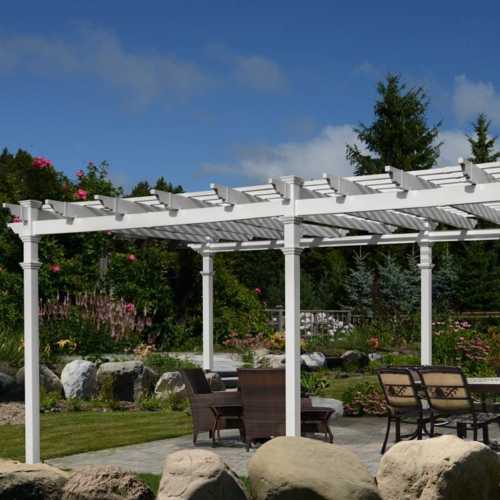 Check out the range of backyard pergola kits we have below, or download a download a PDF comparison chart of all pergolas. Click on any of the pictures below to go to pages with more information and pricing. All prices include delivery to most Canadian locations. 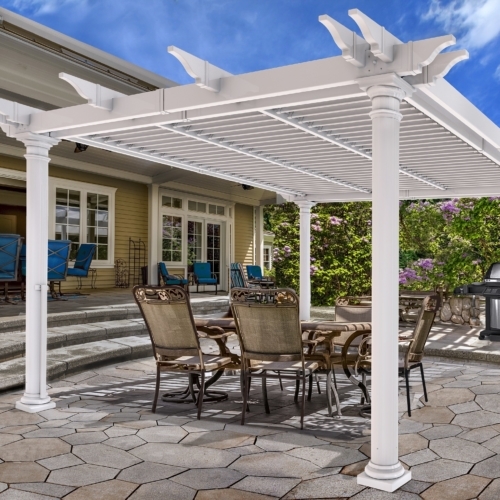 The Aberdeen Louvered Pergola is truly a space defining outdoor room. 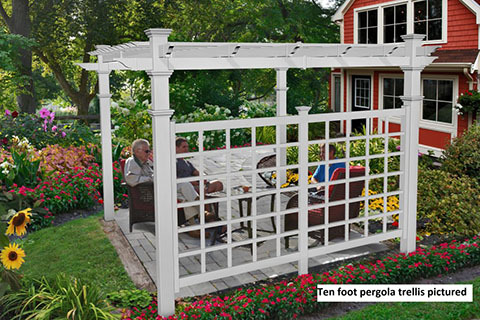 Standing at 12 x 12 it is our first pergola with round columns, giving a distinct and refined Tuscan aesthetic. 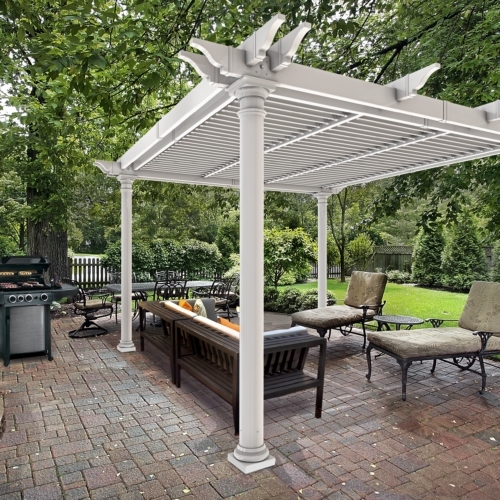 Shade and space in the places that you need it most, but haven’t been able to install a traditional square pergola. Excellent for smaller corners and nooks. A stunning pergola made from a mix of vinyl and recycled wood pulp. It looks like wood with the benefits of vinyl - long lasting and maintenance free. A stunning addition to any yard, the Avalon has a three panel louver system allows for completely customizable shade in any direction. 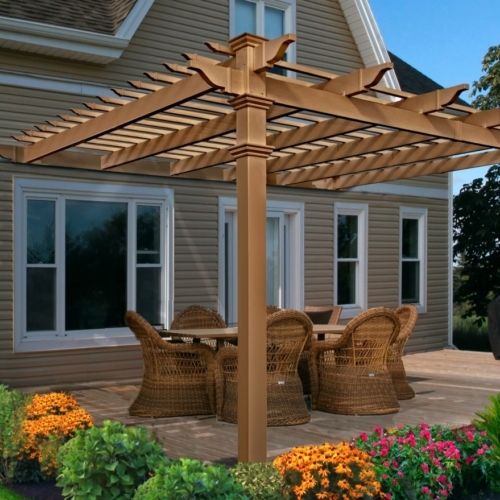 A classic design and one hundred ninety two square feet of shade that stretches 16′ along the side of your back deck or connect your patio to your gazebo. 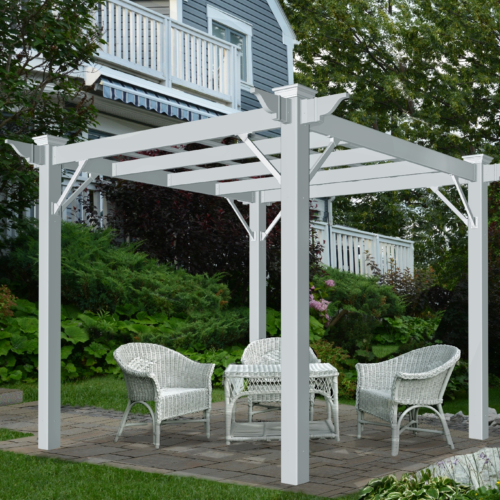 One hundred square feet of classic comfort and shade for your garden. Wood composite shade slats and white vinyl posts will accent any yard. 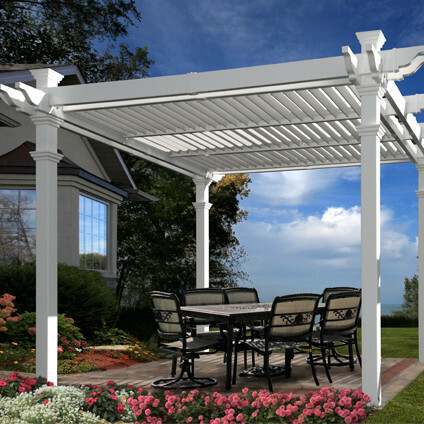 The Bristol Grande louvered pergola is the largest louvered pergola in the New England Arbors family. With it’s 12×24 footprint, it’s as grand as it is beautiful. A beautiful product with the larger 12x12 size and three panel louver system to block out as little or as much sun as you choose. 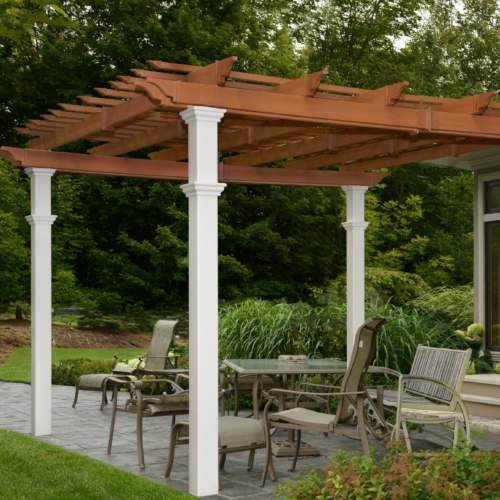 The Cardiff Pergola is the vinyl pergola that fits into any budget. You will love the extra 56 sq. ft. that it adds to your home as well as our classic New England styling. A wall-attached pergola with bold lines, three panel louver system and the flexibility of creating a private space with the flat privacy wall addon. 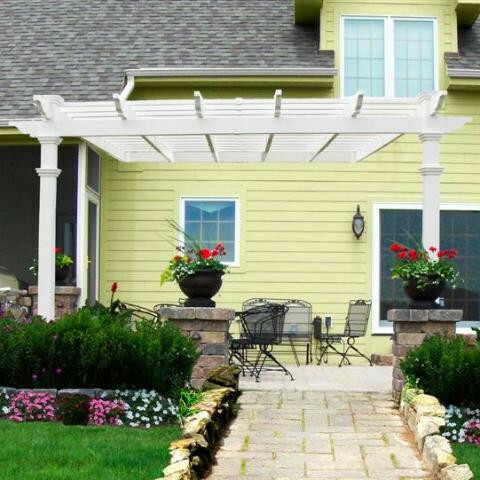 A grand pergola in our most requested style. The Freemont attaches to your home, and addons like the privacy wall make it easy to create a private outdoor room. A spacious pergola made from a mix of vinyl and recycled wood pulp. It looks like wood with the benefits of vinyl - long lasting and maintenance free. A smaller, attractive, affordable and maintenance-free pergola made from a revolutionary melding of vinyl and recycled wood pulp. 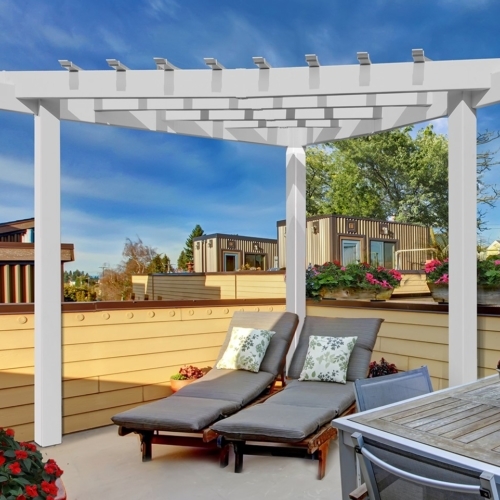 An affordable and virtually maintenance-free pergola made from premium vinyl and maintenance free with a Slide-Lok system that makes installation a breeze. 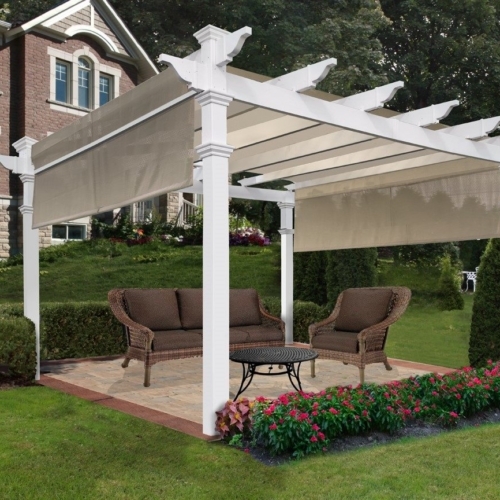 Premium vinyl and maintenance free pergola with the added benefit of privacy and shade from the sun with a full canvas shade cover. 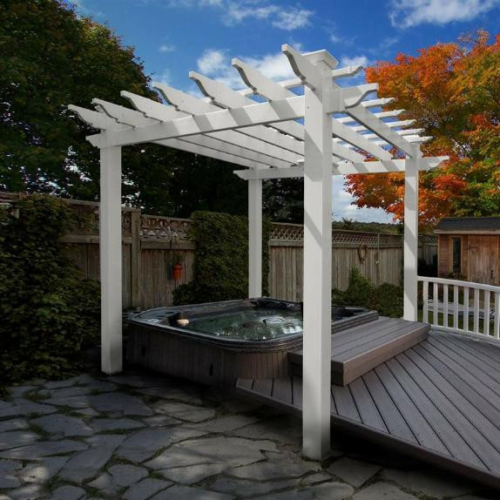 A charming and relaxing outdoor space is easily created with the Mirage Pergola, offering shade from the summer heat and makes a great enclosure for a hot tub. 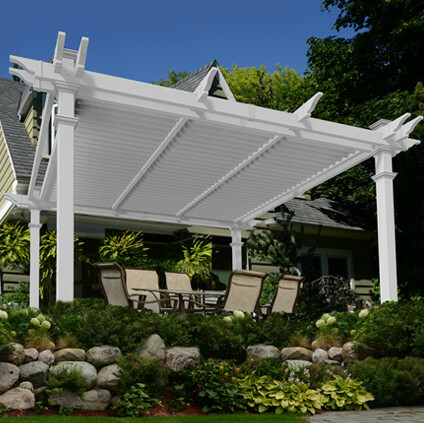 This 12x12 vinyl pergola is 144 sq. feet of relaxation and classic style. The canvas weave lets you create the perfect amount of sun and shade for you, every minute of every day. 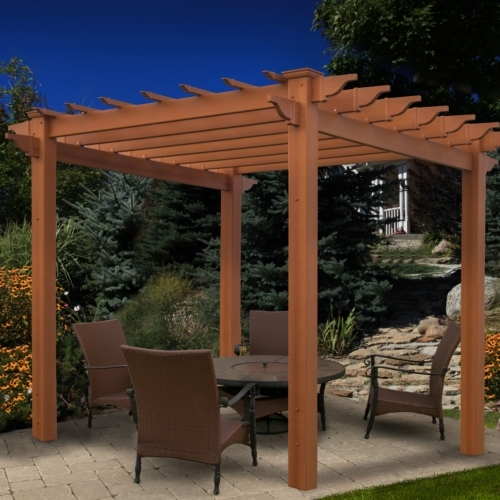 At our smallest size, this vinyl pergola is ideal to encase a hot tub or patio set. Designed with classic New England architecture in mind, it’s as beautiful as it is functional. 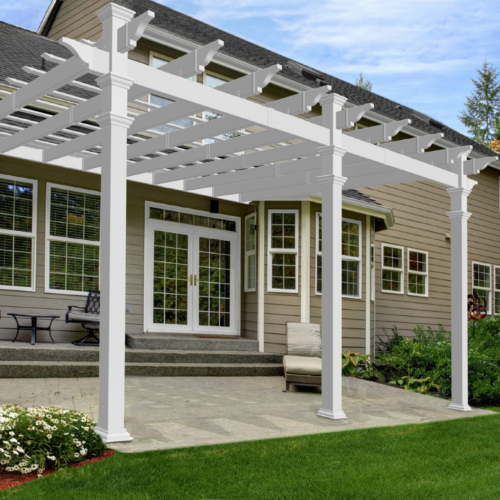 Imagine your home landscaping, complimented by the substantial Preston pergola, featuring round Tuscan columns and 100 square feet of refreshing shade..
A larger 12x12 pergola crafted with premium vinyl and is maintenance free. 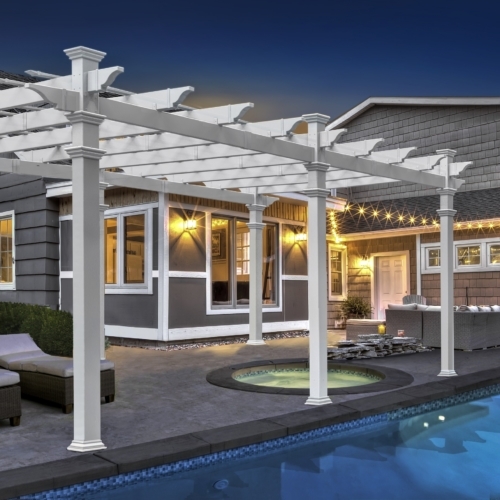 Our largest pergola at 12x24 feet, the Regency Grande has stately columns supporting a massive framework covering over two hundred and fifty square feet. An imposingly stylish 12 x 12 pergola made from a revolutionary melding of vinyl and recycled wood pulp. It looks like wood with the benefits of vinyl - long lasting and maintenance free. 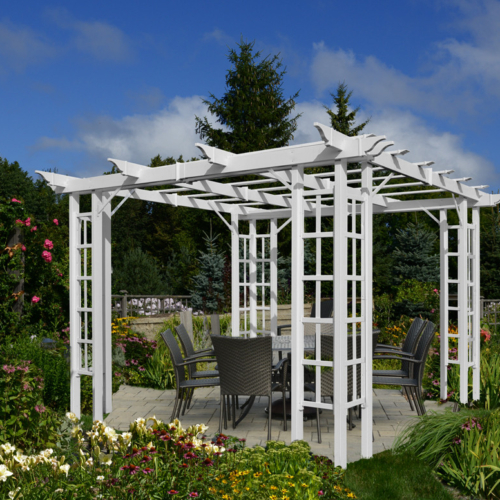 The Trellis Pergola has distinctive trellis style posts that easily support climbing plants. An easy to install, virtually maintenance free oasis for your yard. Our largest wall-attached pergola, the stately architecture of the Valencia provides a full sixteen feet of frontage for your family and guests. 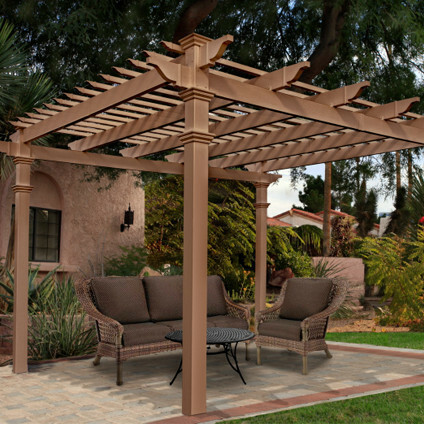 The Venetian Pergola offers shade from the summer heat or makes a great hot tub enclosure. Crafted with premium vinyl, it is virtually maintenance free. 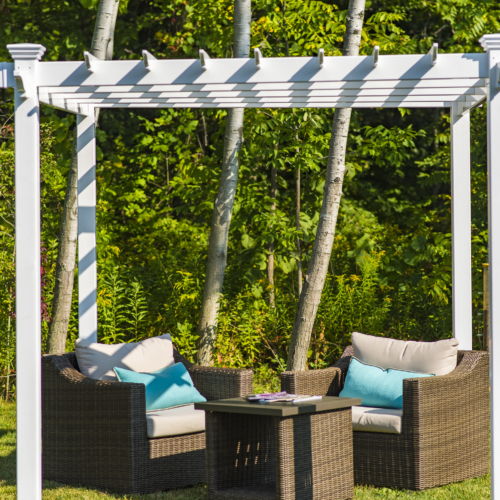 Add extra shade to your Pergola with a Canvas Weave Kit. Easy to install canvas shades attach with Velcro at both sides for a professional and seamless look. 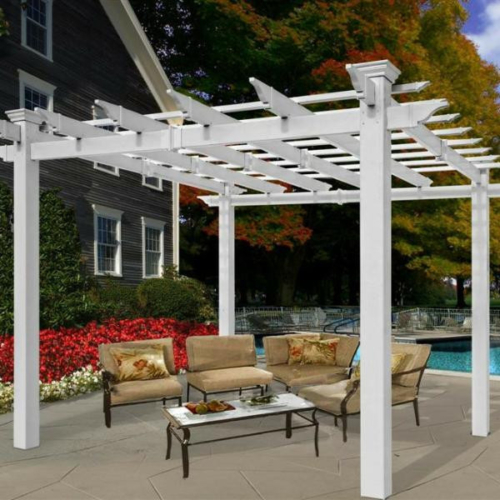 The Pergola Bolt-Down Bracket System makes it easy! 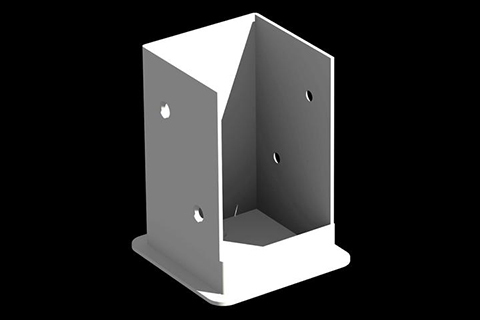 Simply measure your footprint and bolt the galvanized brackets into place. The result is a lasting installation that is safe and rigid. The privacy trellis serves a dual purpose: it provides an excellent matrix for your prize climbers and it provides a measure of privacy from your neighbours.